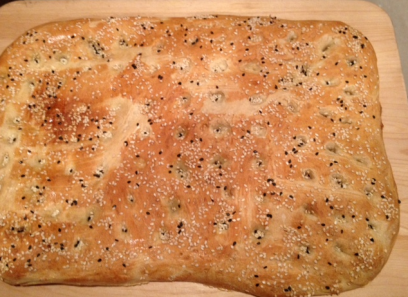 Lagana is a traditional flatbread usually baked for Clean Monday (Καθαρά Δευτέρα) or Kathara Defthera, the first day of Great Lent before Easter. For those fasting most strictly, lagana is made without oil. For those less strict, olive oil is used and never any dairy products. 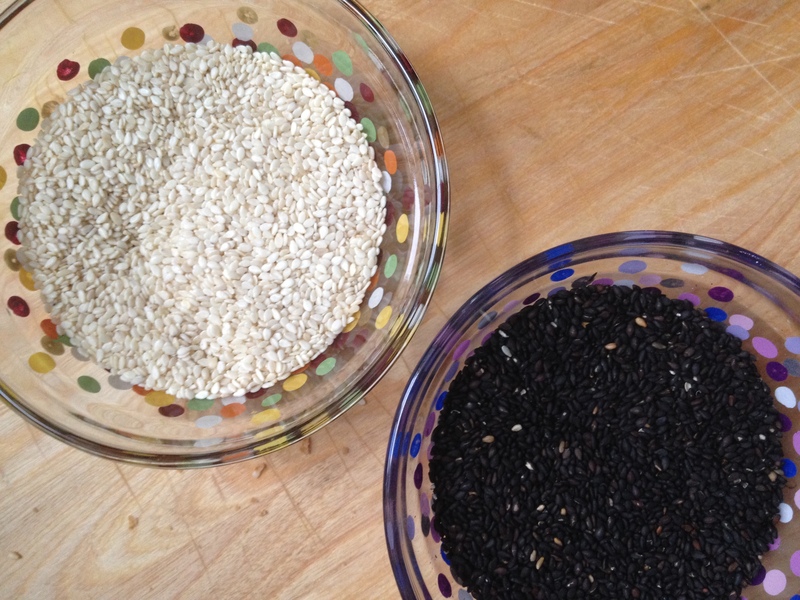 Sesame seeds are the most common topping and often fresh or dried herbs are added for even more flavor. I like to go with black and white sesame seeds and flavor my dipping oil with thyme or rosemary. Don’t be afraid of baking with a yeast dough here if it’s something you tend to shy away from. This is a quick and easy recipe that will make you a bread baker for life! This dough should be just slightly moist so you end up with a nice light, airy bread and not a long, flat, crunchy variation of a bread stick. This is a bread that can easily be made with stronger flours like barley, my Yiayia’s favorite, or whole wheat. I usually use a combination of all purpose organic white flour and barley flour. A nice option is organic white whole wheat flour from King Arthur . There’s no need to use bread flour in this recipe. 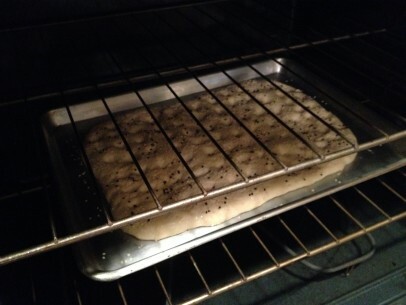 A flatbread gives you more leeway in terms of flour choice because you’re not looking for a high rising loaf. 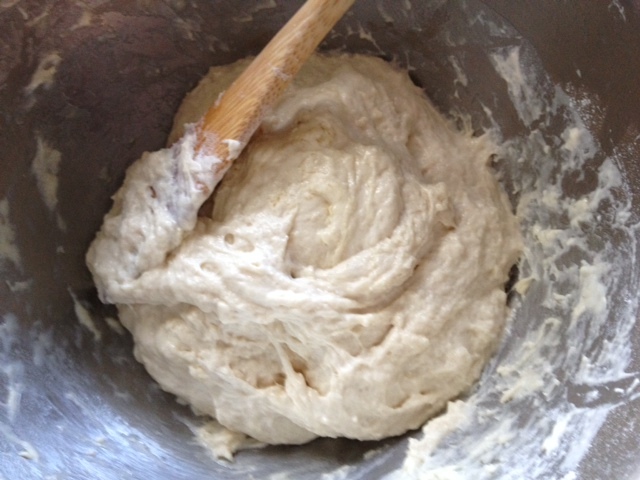 I like to transfer kneaded dough to a clean bowl and make sure you give dough enough time to rise. Simply cover bowl of kneaded dough with plastic wrap or a dish towel and leave in a warm spot to rise. My mom’s sweet spot is the shelf on top of her stove. To shape, gently deflate dough and stretch, pull and pat it into a large rectangle. DO NOT ROLL! Allow the shaped dough to rest and rise for another half hour. An authentic last touch once your shaped, risen dough is to press your fingertips into the dough all along the surface. Be careful not to poke through the dough though. 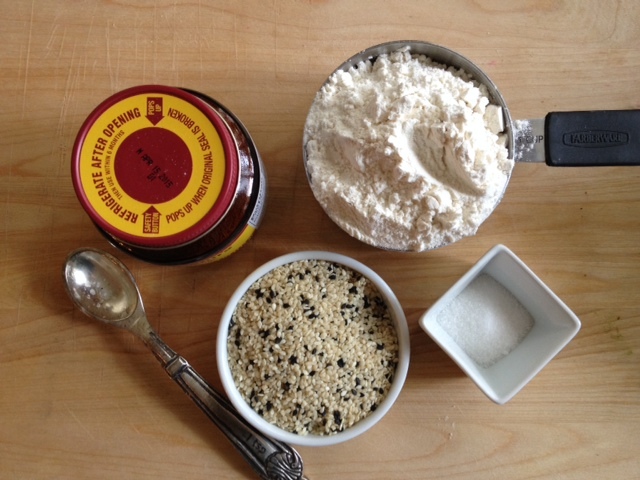 As children, we loved using our fingertips to add the divets after the second rise and sprinkle on the sesame seeds – if there are children in the house, have them pitch right in for this part! And quick tip to help your sesame seeds to stick – one I use for kritsinia (sesame bread sticks) also – dilute apricot jam or honey, 1 part jam to 5 parts water, and brush a very thin coating over the top of your ready-to-bake bread dough. On Clean Monday its traditional to tear and not slice your loaf of lagana to avoid bad luck. The rest of the year I regularly slice baked lagana loaves in strips and enjoy with tomatoey good manestra, garlicky delicious skordalia or vegetable stew. 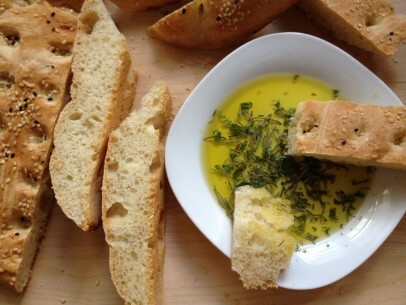 Probably the simplest and one of my favorite ways to serve lagana is with a saucer of excellent quality Greek olive oil flavored with fresh herbs and/or fresh garlic. Just be careful because you can easily finish off an entire flatbread dipping a piece at a time! Lagana is also delicious topped with skordalia or green tomato relish and as the perfect side to greek green beans. You’ll find endless ways to enjoy this simple, traditional bread. Gently brush off the sesame seeds and any stale pieces are great for breadcrumbs. I actually leave the sesame seeds on for a bit of nutty flavor in the breadcrumbs! Place ball of dough in a large, clean bowl that has been very lightly greased with olive oil (or dusted with flour) and cover with clean dish towel or plastic wrap and leave in a warm spot in your kitchen to rise. This should take about an hour to and hour and a half. The dough will double in size. Gently poke your finger into the dough to test if its fully risen. If the dough bounces back immediately, your dough needs more time to rise. The dough should rise just halfway after you remove your finger. 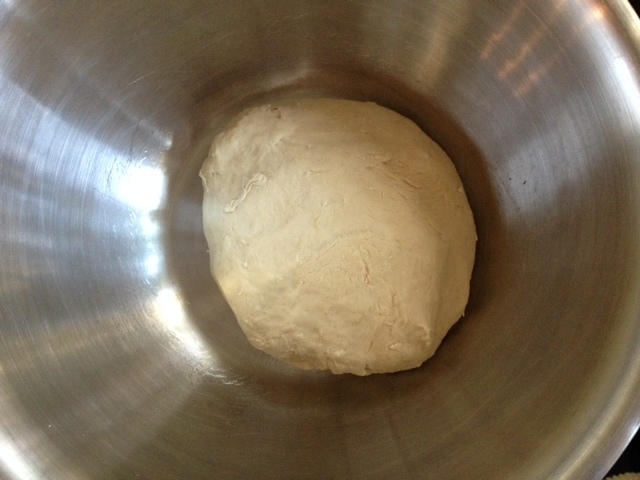 In the bowl, knead the risen dough a few times to deflate it and then turn out onto your pan. Gently stretch and pat your dough into a rectangle. Use your fingertips to press small grooves in the dough. Let lagana dough rest, covered, and rise for another half hour. To make bread wash simply combine jam or honey with boiling water until diluted. Lightly brush with apricot wash, sprinkle with sesame seeds and bake at 400 degrees for 30 minutes until golden brown. Remove from pan to cool. Let rest at least 5 minutes before slicing. We are currently living in Greece and when I saw this bread I thought “Damn! I wish I knew how to make that…” And now I do! Thank you so much. I’ll be baking tomorrow! I am trying this for the first time with whole wheat flour. Have you done this before? I will let you know of the result … I did not have any AP. I have been making this all during Lent. I probably will continue to make this after Lent. I have use a combo of bread flour, whole wheat, and rye flours. My husband and I love it. It reminds me of foccacia bread. I think it would make a great pizza crust, also.